Seeing as they’re back touring and appearing very soon at Crossfire 8 in London, it seems a good time to re-visit The Fuzztones. This clip is from the band’s 80s heyday – the video for The Witch – which you’ll either love or hate, depending on where your tastes lie! 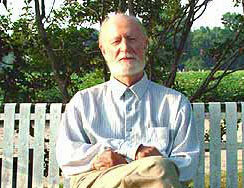 Mose Allison, white Jazz and Blues legend from the Mississippi Delta, inspired key figures in Rock’n’Roll. As Pete Townsend says in the film: ‘Without Mose I wouldn’t have written My Generation’. The film also features Van Morrison, Elvis Costello, Bonnie Raitt, Frank Black, Loudon Wainwright, Ben Sidran, Keb Mo’ and Georgie Fame. Taking Mose back to the Southern crossroads where he was born, we journey with the man they call the Jazz Sage across 50 years of cool philosophical lyrics and hip piano playing on songs like Parchman Farm, Your Mind is On Vacation and Everybody Cryin’ Mercy. The film also contains exclusive performances of Mose classics by Van Morrison and Loudon Wainwright – along with The Who’s barnstorming take on Mose’s Young Man Blues. And if you want to catch the man live, you can see him at the Pizza Express Jazz Club in Soho from September 21st to 30th. For details call 020 7439 8722 or visit the website. 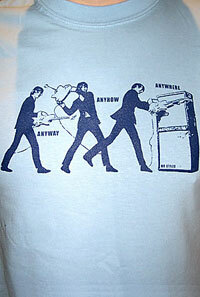 Probably of interest to Who fans is this Anyway, Anyhow, Anywhere t-shirt. Designed by Mr Styles, I’m pretty sure it’s supposed to be an early-era Pete Townshend trashing his guitar an amp. I say pretty sure because I’ve looked up close and can’t quite make him out.But I’m guessing the title and the smashing of the guitar is proof enough. In sky blue only, you can pick it up now from the CX London website (and probably other places) for around £25. 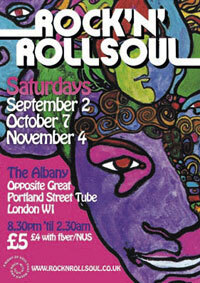 Another online radio show to ease you through the working day, this time from London’s Rock n Roll Soul night. The Rock n Roll Soul Radio podcast mainly covers the soul end of the spectrum, with a mix of 60s and early 70s soul and funk that’s well worth a listen. But note that you’ll need Quicktime to tune in. You can catch the Rock n Roll Soul club night at The Albany, Great Portland Street, London, W1W 5QU on the first Saturday of each month. 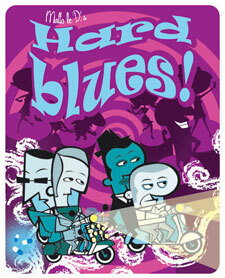 We’ve featured some very smart retro-styled art on this site in the past – Shag, Hisknibs and Kavel to name just three – but here’s another one to add to your list – Matto Le D.
Very much styled in that early 60s cartoon styling (he quotes his influences as commercials from the UPA studios and Jaques Tati movies), Matto’s artwork follows the lead of Shag in going for cocktails, tiki and beatniks, along with an occasional dose of Mod – but with his own twist. The image here is for a comic Motto is currently working on, but if you want to pick up some of his work on canvas, you can buy limited prints (25 only of each) directly from his website. There’s also plenty of other material there to enjoy. Definitely one to watch for the future.